Mac Mini + GTX660 + Echo Express + W7 = Black Screen? I'm having trouble getting my GTX660 to show up in the device manager. I'm using a 2012 Mac Mini with SSD, i7 with intel 4000 graphics and 8gb of ram. I first installed bootcamp which went smoothly, then booted into windows 7 with the eGPU connected. The Mac EFI boot loader would not boot with the eGPU plugged in. I then installed REFIT from OS X, which I understand prevent bios emulation, the boot loader now worked (through the HDMI of the mac mini only). Black screen on boot into windows. I tried starting from sleep as that was said to fix the issue. However the GPU does not show up in device manager, though video output works. Can anyone offer some advice on how to proceed? I just wanted to post an update. The Mac Mini is not compatible with an eGPU because it doesn't run EFI 2.0, only 1.7. Until Apple updates the firmware or releases a new Mac Mini eGPU users are SOL. EFI 1.7 simply will not make the eGPU visible to the OS under any circumstances. I have my external graphics card working with a 2012 mac mini and bootcamped windows 7. It was essentially plug and play for me including a few easy to read steps. EFI worked with my mac mini fine (took a long time actually getting windows 7 and EFI on it though). Are you using an expresscard egpu with the sonnet echo TB/Expresscard adapter or a straight up TB enclosure? Cause if it's the expresscard I could give you the steps to get it working. Connect the wires to your PSU as shown (sorry I just threw that together in paint), you'll have to setup your PSU so you can put it on without a computer. Now keep the Echo connected from when you boot and select win7. Press F8 before the boot splash screen to go to the boot options menu in Win7 and switch on the GPU by putting the PSU on. After about 3 seconds boot into Windows. Your GPU should now be detected. Could you please give a little bit more detailed guide with steps. I would really like to build my setup (2013 13" MBA + GTX660 (Sonnet Echo Express SE @ 10Gbps) ) but this step (to cut the wires and connect them to the psu) seems to me confusing and I am afraid to mess up and brake gpu or psu. Maybe, it would be safer for me to use Sonnet Echo ExpressCard + PE4L ? Do you by any chance have any pictures of the modified cable? I was also wondering if there was a reason you used the +12V off the PCIe 6-pin connector instead of using it off the ATX connector? If the PSU is a single-rail design, shouldn't it not matter...? 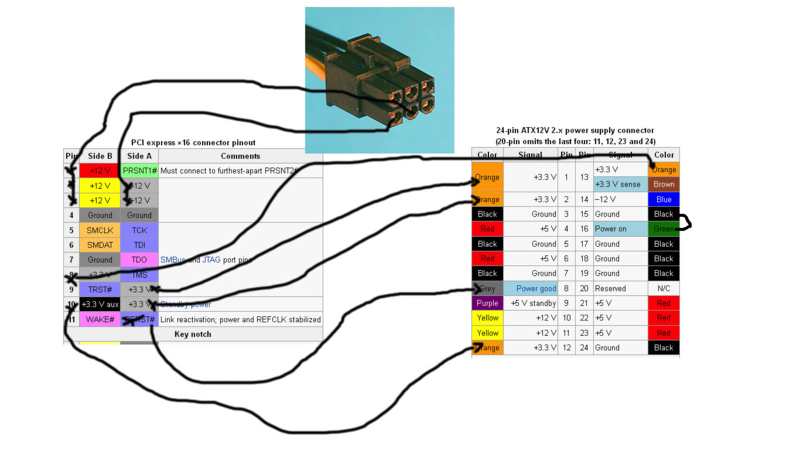 You can get +12V from ATX connector. When I will have the time/luck to make the eGPU work flawless with my dGPU I will try to port the post with more details here. You don't need a breakout board, you just need an ATX 24 pins extender and a flexible PCIexpress riser card. or like in MystPhysX original drawing it will not work (PSU will start and stop immediately). You will also have to provide a grounding, so you will have to solder some grounding pins also. If you eGPU draws power from at least 6 pins connector, grounding is there already, so no problem. Plugged in, I also experience a failure to boot up, much like the OP, and nothing when I plug in after Windows 7 is already running. Thanks in advance! 3. Make sure your entire setup is plugged in and on except your computer which should be turned off. (egpu is turned on and the expresscard is plugged into the sonnet echo adapter, adapter is plugged into your macbook thunderbolt bolt. Also if you have an external monitor, it is plugged into your egpu). 4. Turn on the computer. Your screen will turn grey and you will hear the Mac Chime. While the screen in white, unplug the expresscard from your sonnet echo adapter. 5. Your screen will now turn black. When the Windows icon appears and is loading, plug back in the expresscard to your sonnet echo adapter. You are pretty much unplugging the expresscard when you boot up, then replugging it in when the windows 7 bootscreen appears. Also, what does your Device manager say under display adapter? I also using same config, but I got error 12. anyone can give me the pci.bat and startup.bat? Is there a way to make the mac mini compatible with eGPU without cutting wires? hey there i have a problem my psu doesnt have the pin 8 (power good) can i still use this guide for my egpu?